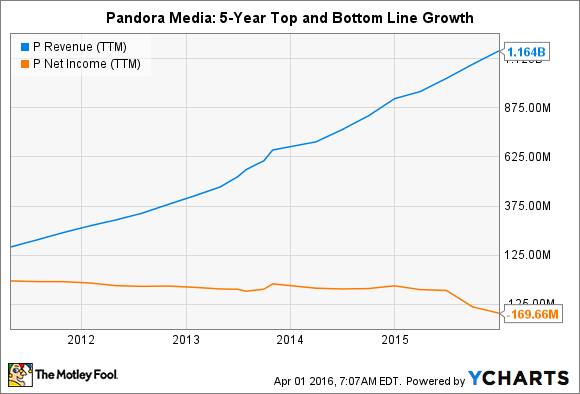 Can Pandora Media Inc's Founder Save The Company? Why weren’t investors thrilled about the co-founder’s return? Shares of Pandora Media (NYSE:P) fell 12% on March 28 after the streaming audio provider abruptly announced that Brian McAndrews, its CEO of two and a half years, would step down and be replaced by its co-founder Tim Westergren. Pandora's stock fell about 50% during McAndrews' tenure, but investors don't seem to believe that Westergren will do much better. Pandora's mobile app. Source: Pandora. McAndrews didn't provide a reason for his departure, but Wedbush Securities analyst Michael Pachter speculated on CNBC that the CEO "probably got bounced for being a little too ambitious." Pachter also warned that Westergren would be leading a company which was "completely different from what he created," noting that "investors don't like it, and they're not going to reward this company until they perform." Is the situation as dire as Pachter suggests? Let's take a look at what Westergren needs to fix to save the company he co-founded 16 years ago. Pandora's business model has two big flaws. First, 80% of its 2015 revenue came from advertising, while just 19% came from paid Pandora One subscriptions. With this model, Pandora relies on advertisers broadcasting ads to its free listeners. But the more songs free listeners stream between those ads, the more royalties Pandora must pay to record companies. As a result, total content acquisition costs rose 37% in 2015 to $610 million, gobbling up 65% of Pandora's advertising revenues -- up from 61% in 2014. Second, Pandora lacks clout in negotiating royalty rates with record companies. Apple (NASDAQ:AAPL), for example, leverages the iTunes store and its massive retail footprint to secure exclusive deals with top artists like Taylor Swift. Both Apple and Spotify pay fixed percentages of their paid subscription revenues to artists, which is generally easier to calculate by user than Pandora's mostly ad-based model. To make matters worse, Pandora actually pays Apple and Alphabet's Google commissions when users subscribe on their iOS and Android apps. Those commissions accounted for about 12% of its non-GAAP sales and marketing spend last year. Last quarter, Pandora's total active listeners fell 0.5% annually to 81.1 million. However, total listener hours rose 3% to 5.37 billion, indicating that Pandora was racking up higher royalty expenses by playing more songs without gaining any new listeners. Pandora has a lot more overall listeners than Apple Music and Spotify, but it squeezes out a lot less revenue per user while streaming more songs. For example, Apple Music reportedly reached 10 million paid subscribers at the beginning of this year. With a $10 per month subscription rate, those subscribers would generate $300 million in revenue for Apple per quarter -- a drop in the pond for Apple, but nearly matching Pandora's revenue of $336 million last quarter. Billboard estimates that Spotify currently has 25 to 30 million subscribers paying subscription fees between $5 to $10 per month -- indicating that it will likely generate more revenue than Pandora this year with fewer listeners. Spotify reported $1.22 billion in sales in 2014 (its most recently reported year), which already eclipses Pandora's 2015 revenue of $1.16 billion. Under McAndrews, Pandora tried to diversify its business model by buying Ticketfly for $450 million to sell concert tickets, scooping up the assets of its struggling rival Rdio for $75 million, and promising to invest $345 million this year to scale up its infrastructure to support new music services. McAndrews also believed that Pandora could build a $1.3 billion subscription business over the next five years under a tiered pricing system. Those plans, which required Pandora to issue a $300 million convertible debt offering, didn't impress most analysts or investors. It was doubtful that a company which had failed to grow a meaningful paid subscriber base could suddenly do so by expanding its infrastructure, adding new services, and offering new pricing options. Those expenses would also push Pandora's bottom line much deeper into the red, which couldn't simply be offset by selling concert tickets -- which generated just 3% of its revenue last quarter. Will Westergren fare any better? But now that Westergren has taken over as CEO, those ambitious plans might be rolled back a bit. While that might be a logical cost-cutting move for the company, it won't address Pandora's challenges of peaking listener growth, wobbly ad revenues, high royalties, and its weak growth in paid subscribers. Therefore, I'd advise investors to stay away from Pandora unless its new CEO offers investors meaningful plans to fix those four problems.